Ruben soon became my confidante. I found myself turning to him for advice, gossip or just everyday conversation. After finishing our respective degrees we both moved home. We were caught up in the dot.com boom and both started work in Internet startups. This brought us even closer together. Ruben and I started to car pool. He would pick me up in the morning and in return for the ride to work; I would prepare breakfast for us. After work, we would meet for drinks or dinner with friends. I begun to see another side of him and I found myself drawn to him. He had been so many things to me for so long, suddenly I felt there was so much more I needed to know about him. I was curious, but felt I had to tread carefully for he was still a good friend of mine. The last thing I wanted to do was to ruin our friendship. The chemistry was undeniable and the more time we spent with each other, the stronger we felt for each other. 3rd of December 1999, Ruben picked me up from my house. This was like any other day, but for some reason it felt different. When I got into the car, he was wearing a pink shirt and a pink tie, the scent of his cologne even made me lightheaded. I looked at him and suddenly I was ‘uncomfortably comfortable’ in his presence. My heart was racing, my palms were sweaty and for the first time since we met I couldn’t look him in eye. I knew at that very instant, I had fallen in love with my best friend. I believe we met sometime in 1996 at some dingy bar in London named Vogue. We exchanged hellos but I did not really get a chance to impress her with my corny jokes as I don’t think Vogue was really her scene and she left as soon as she got there. Was not really sure what she was doing there in the first place. In fact, till this day, she insists that she has never been there and that we met in Hanover Grand or something. Fortunately for me, we did meet again in 1998 when we were both back in KL for summer. This time we were properly introduced and we did get the chance to know each other better. We got on pretty well that summer I would say although it was only for a brief period of time. It is when we both went back to London that we became very good friends. We would talk to each other everyday about nothing. We definitely meet up for drinks at least twice a week. She would look to me for advice. I would look to her for gossip. It was a pretty fulfilling platonic relationship. 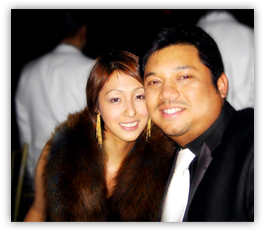 We then both moved back to KL in mid-1999 to begin our careers. We would meet up everyday for drinks after work and just sit and talk for hours. Weekends were just party central at the time. The more I hung out with her, the more I wanted to be with her. Without knowing it, she was showing me more and more day by day that we were meant to be together. Don’t get me wrong, we did not have very much in common but somehow we complimented each other extremely well. I think that is still true today although I am trying my best to get her hooked on golf. On the 3rd of December 1999, we had decided to meet up for lunch that day. By chance I had been wearing a pink shirt with a pink tie and everyone knows she loves pink (have you seen the shop?!). She was wearing a cute little Japanese schoolgirl outfit that looked hot (not that I like little Japanese school girls or anything). Well, to cut a long story short, she hit on me during that lunch break. I was thrilled but I decided to play it cool being the macho kinda guy I am. I was beginning to regret that I had missed my opportunity when I decided to reciprocate her advances later that night. I made a move and she did not hold back and the rest they say is history ……. Copyright © 2005 - 2006 Rubenandshirieene.com. All Rights Reserved.